A photo exhibition of crumbling border posts opens in Berlin to mark thirty years of the border-free Schengen Agreement. But why are so many of these buildings still standing? Also, next year’s Gumball 3000 is 5000km from Dublin to Istanbul. Legal action on the ‘foreigner toll’ could have implications for the UK’s HGV Levy warns German Transport minister. The Bulgaria-Romania New Europe Bridge across the Danube actually beats expectations. The Grenoble-Briancon road to reopen ‘within weeks rather than months’. Photo exhibition marks thirty years since border-free agreement signed. The former Rattersdorf-Köszegcs crossing between Austria and Hungary, Ignacio Evangelista. As the EU celebrates this week the thirty years since the border-free Schengen Agreement was first signed, photos of crumbling border posts go on display in Germany. Evocatively titled ‘After Schengen’, the set of sixteen prints by Spanish photographer Ignacio Evangelista is on show at Stiftung Mercator in Berlin. ‘Border crossings have a function of geographical boundaries, but also a coercive role, since they prevent the free passage of people between one and another state. So, they are places that, along with a cartographic dimension, are provided with historical, economic and political reminiscences,’ says Evangelista. He might have asked why so many of the border buildings remain. To be fair there are practical reasons, as well as perhaps the niggling thought that they may be needed again. 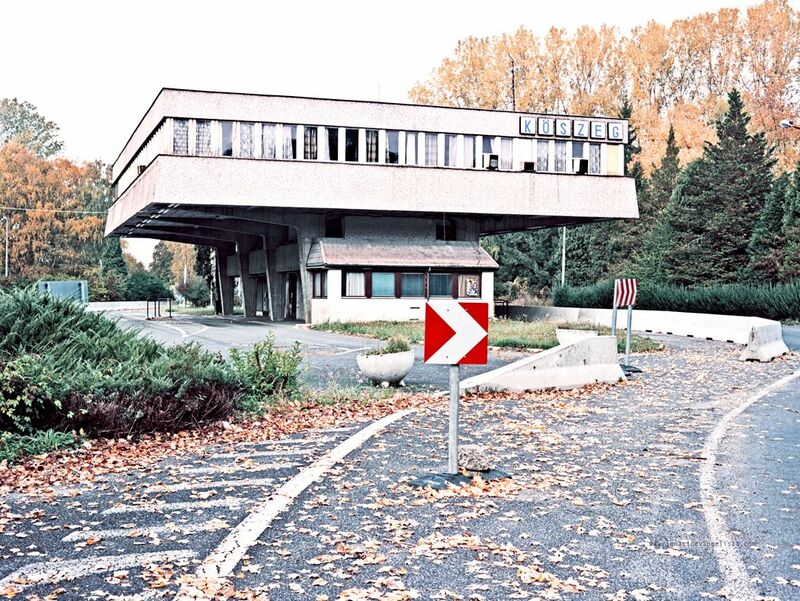 Involving as it did months of motorway disruption, even Luxembourg, an original signatory, only got round to removing the Zoufftgem border buildings on the French border last year. It still has no plans to take down those in Sterpenich, on the Belgian border, nor the A1 crossing towards Germany. Meanwhile, Hungary only joined Schengen in 2007, along with the Baltic States, Czech Republic, Slovakia and Slovenia. Despite its undoubted convenience for trade and tourism, the zone is a source of continuing controversy. Just this weekend, French police were involved in a standoff with North African migrants at the Italian border at Ventimiglia. The Schengen Agreement was signed in the small Luxembourg border town of Schengen, hence the name, on 14 June 1985, initially between the three Benelux countries, Germany and France. It celebrated its twentieth year in operation in March this year. See more of Evangelista’s ‘After Schengen’ photos here. After two trans-Atlantic rallies the past two years, Gumball 3000 plans an adventurous 5000km route from Dublin to Istanbul in 2016 according to @Shmee150. Specifics are not available yet but the high profile event also visits Edinburgh, London, the Swiss Aps, Budapest and Bucharest. The latter stage might have included Jeremy Clarkson’s favourite Transfagarasan but Romania’s famous road only opens July-November. Next year’s Gumball takes place 30 April-7 May. Work started last May to extend Tranfag’s opening times to nine months of the year but is expected to take until 2018.
roundup: GERMANY. Transport minister Alexander Dobrindt cites the UK’s HGV User Levy ahead of a European Commission meeting on infringement proceedings against his ‘foreigner toll’ reports EurActiv.com. The UK truck charge – which raised £46.5m in its first year it was announced yesterday, twice as much as expected – is effectively paid only by foreign hauliers. Domestic firms have Vehicle Excise Duty (VED) reduced to compensate, the same principle as the German toll, due next year. Dobrindt warns any legal action would have far-reaching consequences for other country’s tolling systems. The Commission reportedly meets tomorrow (17 June) to consider the issue. BULGARIA-ROMANIA. Despite widespread misgivings, the Danube Bridge 2 between Vidin and Calafat, opened on 14 June 2013, has performed ahead of projections says Novinite.com. It was expected to carry 450,000 vehicles each year but has in fact seen 1.1m in total, around 45% of them HGVs. Called the New Europe Bridge, it is only the second fixed crossing along the two countries’ shared 280 mile Danube border. Tolls range from €6 for cars to €37 for trucks 12t+. FRANCE. The D1091 between Grenoble and Briancon in the Alps is still shut at Lake Chambon though it should reopen in ‘weeks rather than months’ according to local reports. The provisional open date is 20 July. Works to repair the tunnel, severely cracked in a landslide on 10 April, took a major step forward last week when the damaged wall was successfully removed. Plans to start a bypass ferry service – which would take six weeks to get up and running – are on hold until the end of June. In the meantime the – lengthy – detours are the N85/N84 via Gap, or the A43 Frejus Tunnel into Italy and back to Briancon on N94 Montgenevre (or the D902 Col du Galibier (2646m) from A43 Saint-Martin-d’Arc).